by Joseph Anthony Wittreich, Jr. The Newsletter sends season’s greetings to all its readers and special thanks to its many contributors, whose generous interest in this publication has seen it through another year. Again we owe a seasonal debt to Robert P. Kolker, whose index to Volume II of the Newsletter appears in this issue. Our publication of Robert Essick’s “Finding List of Reproductions” continues in this issue with part II (and some addenda to part I). Parts III and IV will complete the List and will appear as a substantial supplement to a future number, hopefully the March issue. 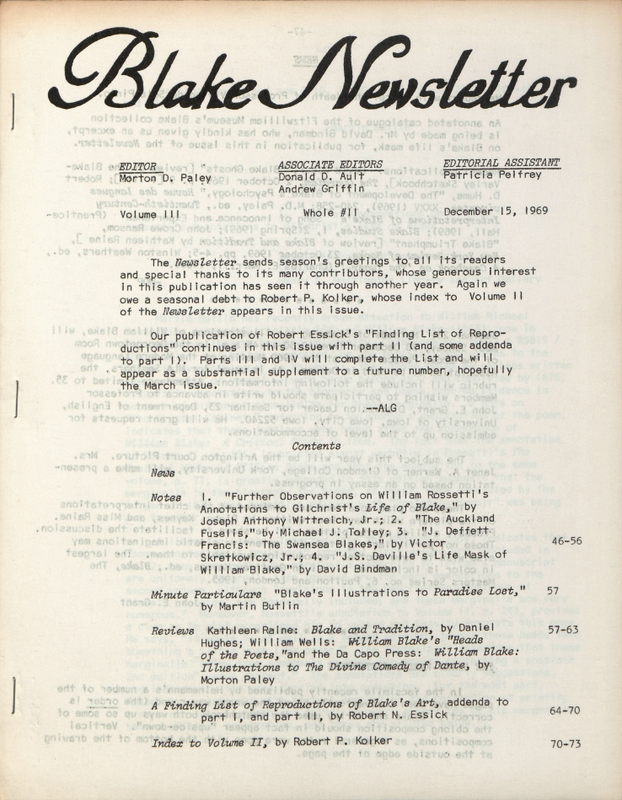 The BLAKE NEWSLETTER, Department of English, University of California, Berkeley, California 94720. Subscription price: $2.00 for one year; invoiced subscriptions $3.00; overseas subscriptions by air $3.00, by surface mail $2.00 Please send checks or money orders*↤ * to the Associate Editors in Berkeley payable to “Blake Newsletter.” Residents of Britain may pay by Postal Money Order for 16/9 (£ 10s by air) if money order is open and uncrossed, but these must be sent to Morton Paley, 24, West Heath Drive, London, N.W. 11, England. Please do not send checks on foreign banks either to Morton Paley or to the Associate Editors in Berkeley. American currency is preferable if possible.